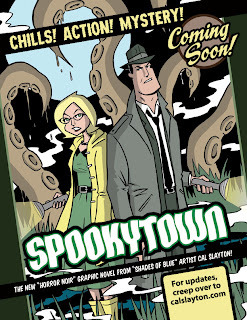 I took a Spopkytown pin-up and created a print ad for the book. It's supposed to appear in Samax's upcoming ghettoManga Quarterly. Samax, when's that coming out? Have I missed it already? 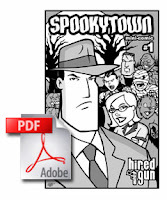 A while back, I made the original mini comic available in a pdf format, for those who never read it and might be interested in it. Just click on the icon on the left to download it. 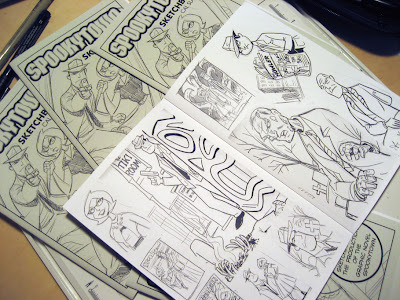 If you're interested, I have still have some sketchbooks for sale. It’s a 20-page mini-comic type book containing over 70 sketches, drawings and doodles that I’ve done will preparing to start the graphic novel. I printed up a limited edition of 100 books. Each is hand numbered and signed, I usually do a sketch on the back too. Just drop me a line if you'd like to buy one, they're just 5 bucks. Geez, I need to work on my ad too. Thanks for the reminder! This Weekend - Tulsa Defcon!